Fig. 1. Molecular pathways of cellular senescence. 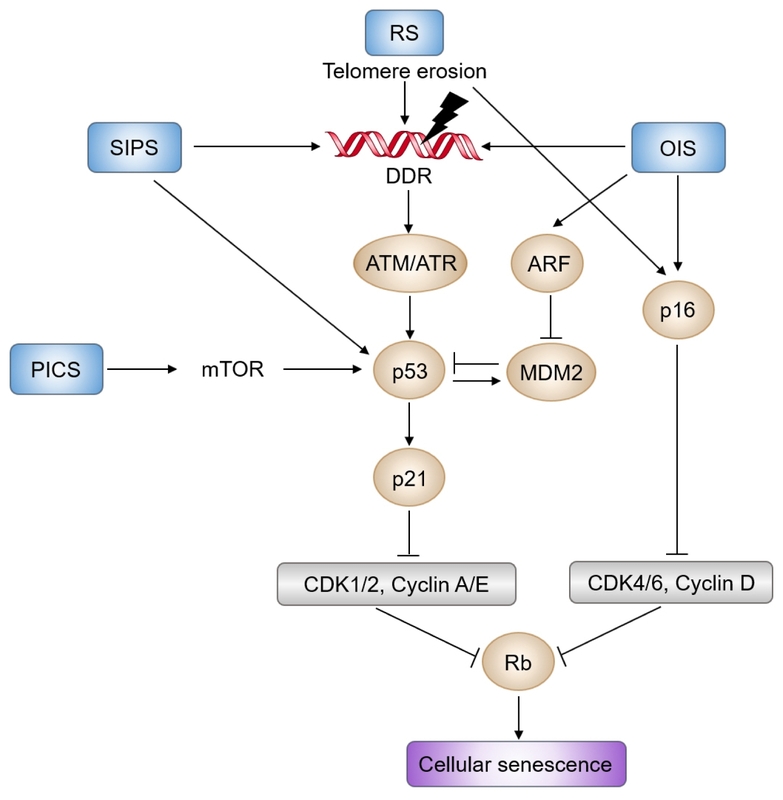 DDR (DNA damage response) triggered by telomere erosion or OIS (oncogene-induced senescence) is mediated by ATM/CHK2 and ATR/CHK1, which blocks cell cycle progression via phosphorylation and stabilization of p53. Activated p53 induces transcription of CDK inhibitor p21CIP1encoded by CDKN1A, which inhibits CDK2 activity, thereby activating RB and inducing cell cycle arrest. In parallel, various stressors also induce expression of the CDKN2A locus, which consists of p14ARF, p16INK4a, and p15INK4B. p14ARF prevents p53 destabilization by degrading the MDM2 proto-oncogene. Meanwhile, p16INK4a and p15INK4B suppress CDK4 and CDK6, thereby eventually activating RB. PICS (PTEN loss-induced cellular senescence) also activates p53 through the mTOR pathway. Altogether, prolonged activation of the p53/p21CIP1 and p16INK4a/RB signaling pathways leads to hypophosphorylation of RB, which blocks the cell cycle in G1 phase, and ultimately causes cellular senescence. RS and SIPS indicate replicative senescence and stress-induced premature senescence, respectively.